The most important component of Abby’s teaching has been her own presence: calm, curious and accepting. The sense of warmth and appreciation she offers the children cannot be underestimated. When children raise challenging topics or offer responses that could “throw” some teachers, Abby responds with care and with genuine curiosity. What I appreciated was the way that Abby empowered the children. She accepted their responses and gently helped them to recognize their own self-regulatory options. She paced the lesson well – moving skillfully between stillness, discussion and movement – all the while embodying the message that she was trying to convey. Her language was clear and easy for the children to follow. Additionally, integral to every lesson that she leads, is mindful listening,mindful breathing and a heartful closing. In each lesson the concept of noticing was central: noticing our own bodies, our physical and emotional responses, and our own needs. From there she gave options for adjusting accordingly. 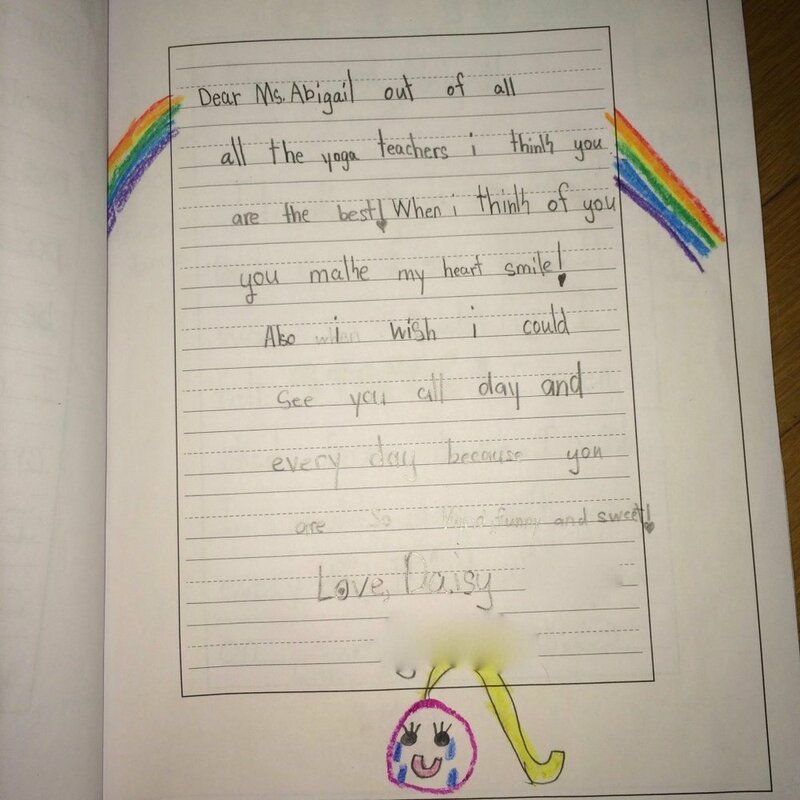 Another important component of Abby’s work has been the impact on teachers. Each lesson that she does in classrooms is geared to the teachers as well as the students. Through watching (and hopefully participating), the teachers learn these same tools for themselves. Abby’s lessons also provide a powerful vehicle for modeling so that teachers learn techniques and approaches to use once Abby is gone. For many teachers, it is the watching of someone else working with their students that makes the difference and gives them the confidence to then “give it a go” on their own. Abby scaffolds her teaching in such a way that the teachers can learn simple and easy-to-implement practices. She is respectful and supportive of teachers. In my own classroom (a group with a large cluster of children identified with behavioral and learning needs) her teaching style has been geared to reach everyone. Some children need a high level of sensory and motor engagement. Some need verbal directions scaffolded and simplified. Her teaching is multisensory and effective. The children like her and look forward to her visits. For me, as the teacher, her impact is less around particular lessons, than the opportunity I have had to watch another mindfulness instructor with my students. I have been carefully studying the way that Abby weaves mindfulness and movement together. It is incredibly powerful to learn from a colleague and such a rare and valuable opportunity to observe someone as skillful as Abby. A specific example of her impact comes from a lesson on relevance I observed Abby do with another class. I loved its clarity and the way she languaged it. The next day, as I was planning a Ruler SEL lesson, I realized that I could incorporate much of what Abby did into my next Ruler lesson. Because of her clarity and very clear purpose, I was easily able to take what she did, get some great ideas and then modify them for my own needs. I would imagine that other classroom teachers, similarly, take her work and integrate it into their SEL or mindfulness teaching.